A receptionist quietly speaks a patient's name, rather than screaming it across the waiting room. Wearing rubber gloves, a primary care provider asks a patient, "May I touch your arm?" An examination table offers privacy by facing away from the door. These scenarios are all examples of trauma-informed primary care, which has gained attention since the advent of the seminal 1990s Adverse Childhood Experiences (ACE) Study, which indicates that an adult's risk for chronic physical health conditions (e.g., COPD, diabetes, and heart disease) and behavioral health issues (e.g., depression, sexually transmitted diseases, and substance use) increases with the amount of trauma experienced as a child. The value of trauma-informed primary care is irrefutable because a primary care physician's office is the first—and sometimes only—place that an individual with behavioral or mental health concerns receives care. Attesting to this fact is Tracy Knight, LICSW, social services director at Bread for the City, Washington, DC, and a member of the practice transformation team of the National Council for Behavioral Health's "Trauma-Informed Primary Care: Fostering Resiliency and Recovery" initiative. Many individuals present in Bread for the City's primary care clinic, she says, never making it to a behavioral health care setting. Stigma associated with a behavioral or mental health care issue may be the most obvious reason that an individual doesn't seek mental health care. It's far easier to admit that one might have a physical health condition than a behavioral or mental health issue. Other reasons include health care insurance limitations and an individual's inability to recognize symptoms as pertaining to behavioral or mental health, according to Arabella Perez, LCSW, an assistant clinical professor at the University of New England and a member of the practice transformation team of the National Council's trauma-informed primary care initiative. In agreement is Virna Little, PsyD, MBA, LCSW-R, CCM, SAP, senior vice president of psychosocial services and community affairs at The Institute for Family Health, Advancing Integrated Mental Health Solutions Center consultant for the University of Washington and New York State Office of Mental Health, and a member of the National Council's trauma-informed primary care practice transformation team. She says, for example, that male patients who report irritability and relationship difficulty are usually unaware that such symptoms can indicate depression among their gender. In some cases, she adds, an individual may simply believe that his or her behavioral or mental health issue is untreatable. For example, a person with PTSD may have learned to live with anxiety or may believe that nothing can be done about flashbacks, she says. Put simply, the trauma-informed perspective is not "what is wrong" with a patient but, instead, "what has happened to" a patient. "It honors and uses the science of what we know now about trauma—about how it physically impacts our bodies, years after it's happened," Knight says. Via trauma-informed care, a primary care provider can treat patients more effectively, thereby improving health outcomes. For example, a holistic approach—or acknowledging a connection between a patient's past trauma and the presenting issue—can help a provider make a more informed diagnosis. "Instead of prescribing the same thing for a headache and having the patient repeatedly return," Perez says, "[trauma-informed care] gives the provider pause to think, 'Maybe my intervention is more of a Band-Aid, as opposed to being more adaptive to the bigger thing happening here.'" Through psychoeducation, a trauma-informed primary care provider can help a patient to connect the dots, or understand the link between past trauma and present-day health, according to Karen Johnson, MSW, LCSW, director of trauma-informed services at the National Council for Behavioral Health. The trauma-informed provider, she says, can help a patient come to the self-realization that "it's not that I'm 'broken,' 'lazy,' or whatever pejorative term is used. It's that something that has happened to me has impacted me in this way." • and cultural, historical, and gender issues. In reference to the first principle—safety—SAMHSA elaborates: "Throughout the organization, staff and the people they serve feel physically and psychologically safe." Experts agree that each member of a primary care organization—from the physician to the receptionist and the nurse to the janitor—must be aware of the principles of trauma-informed care, treating all who enter the office with sensitivity and respect. "Everyone in an organization must first understand the prevalence and impact of trauma and that everyone who comes into an organization likely has been impacted by events in their life," Johnson says. Trauma-informed staff "behave in a way that ensures that we're never retraumatizing patients throughout our service provision." Trustworthiness and transparency, according to SAMHSA, mean that "Organizational operations and decisions are conducted with transparency and the goal of building and maintaining trust among staff, clients, and family members of those receiving services." "We can profoundly shift and change all our policies, practices, and procedures in a given setting to mitigate the impact of trauma and increase healing," Johnson says. "We know healing happens when someone feels safe and is engaged in a trusting relationship in which we feel empowered to speak and feel we are part of a team." Peer support and mutual self-help, SAMHSA maintains, "are integral to the organizational and service delivery approach and are understood as a key vehicle for building trust, establishing safety, and empowerment." Johnson says, "Trauma-informed primary care providers help them [patients] to understand how they can move forward, help their brain, understand what activates them in a certain setting, ask for what they need, and advocate for themselves." Collaboration and mutuality, according to SAMSHA, refer to "true partnering and leveling of power differences between staff and clients and among organizational staff from direct care staff to administrators. There is recognition that healing happens in relationships and in the meaningful sharing of power and decision-making. The organization recognizes that everyone has a role to play in a trauma-informed approach. One does not have to be a therapist to be therapeutic." Rather than following a top-down approach, trauma-informed care insists upon a trust-based collaborative approach among all, from employees to clients. "The primary care provider," Knight says, "understands that the patient still knows best." SAMHSA says of empowerment, voice, and choice: "Throughout the organization and among the clients served, individuals' strengths are recognized, built on, and validated, and new skills developed as necessary. The organization aims to strengthen the staff's, clients', and family members' experience of choice and recognize that every person's experience is unique and requires an individualized approach. This includes a belief in resilience and in the ability of individuals, organizations, and communities to heal and promote recovery from trauma. This builds on what clients, staff, and communities have to offer, rather than responding to perceived deficits." Trauma-informed care "strengthens and supports the resiliency we already have," Knight says. "Instead of a provider assuming they know best, they share their important clinical knowledge with patients but are still in partnership with a patient." 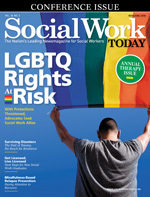 Cultural, historical, and gender issues, SAMHSA says, mean that "The organization actively moves past cultural stereotypes and biases (e.g., based on race, ethnicity, sexual orientation, age, geography), offers gender responsive services, leverages the healing value of traditional cultural connections, and recognizes and addresses historical trauma." Perez recalls a colleague who works with the Northwest United States' indigenous population. Trauma screening there, she says, resonates with patients by focusing on resiliency, inquiring about history and forebears, and using words such as "ancestors." The Washington, DC-based National Council for Behavioral Health is a nonprofit association of 2,900 member organizations that deliver mental health and addictions services to more than 10 million adults and children. In 2017, the National Council convened 11 health care and health care-related professionals to serve as the practice transformation team for its three-year "Trauma-Informed Primary Care: Fostering Resiliency and Recovery" initiative supported by Kaiser Permanente. The team's goal is to develop a model that primary care providers can use with patients affected by trauma. The model is to be piloted in select primary care settings.